The HCSB (Holman Christian Standard Bible) is one of the newest Bible translations on the scene. Whereas many other translations continue to go through revamps, the HCSB proclaims to be a new translation aimed at a formal equivalence with modern English. First a few words on the translation and formatting. I appreciate the manner they set apart “dramatic prose” in the New Testament as distinct from regular didactic (eg. 1 Corinthians 15; Philippians 2). This draws the reader’s attention to the fact that the New Testament, and especially Paul’s writing, has dynamic elements to reflects the poetry and prophetic styling of the Old Testament. The HCBS bolds and block indents the Old Testament quotations present in the New Testament. At first, this seemed a little over the top, but it is actually quite useful. Unfortunately, the words of Christ are in red. Though I lament this, major publishers do not seem to mind. 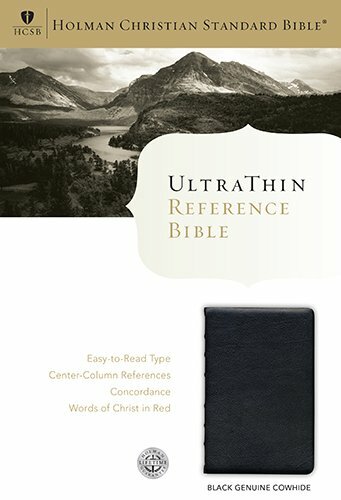 This "Deluxe Ultrathin Reference" edition comes with significant cross-reference notes as well occasional textual notes. The font is quite small but is necessarily so given the desired size of the Bible. It travels well. It fits well in a hand and lap. The version I received was "top grain cowhide." As an avid reader, holder, and smeller of physical books, holding this Bible is like a dream come true. It feels amazing. To some this might seem insignificant, but the connection between book aesthetic and content is important. In conclusion, the HCSB Deluxe Ultrathin Bible is the best Bible I have ever used. It works well as a church bible and home study bible. In studying with this Bible, my appreciation for the HCSB has grown leaps and bounds. I have even begun to utilize it's translations in my blogging. I'm going to be using this Bible until it falls apart.